Compare charts of different strategies. Examples of charts are presented below. To open a Strategy charts, first select Account → Asset portfolio → Strategy. Then click the Chart button in the Positions form. You may also choose more than one strategy simultaneously by selecting strategies while holding down the Ctrl or Shift keys on the keyboard. After that, a Strategy charts window will open. 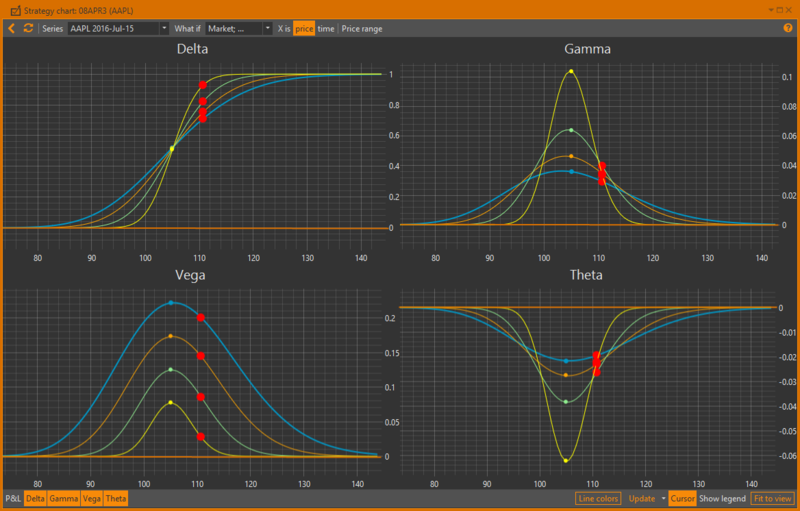 Initially, it shows charts of profilt/loss, Delta, Gamma and Vega. 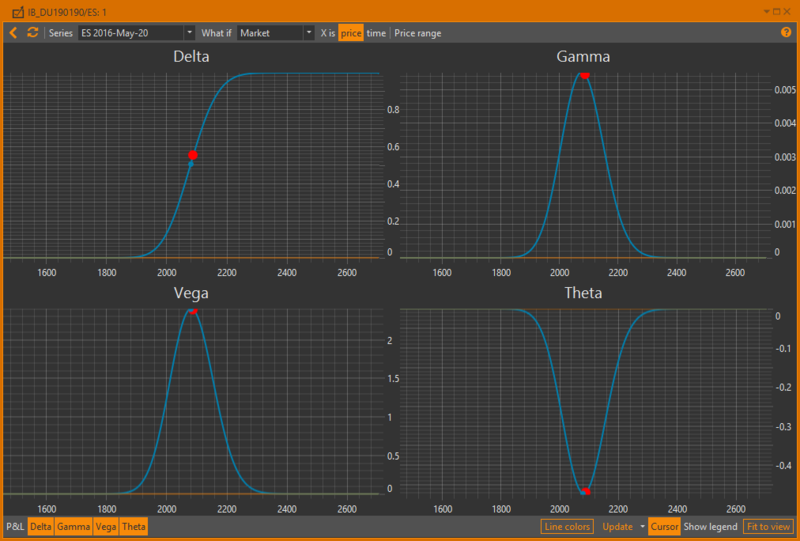 You may select charts to display using the PnL, Delta, GammaL, VegaL and Theta buttons on the bottom toolbar. Option Workshop remembers the last used chart settings (opened charts) and applies them to newly opened charts. If you build charts for more than one strategy simultaneously you can select the strategies for which the profit / loss chart and the greeks charts display. 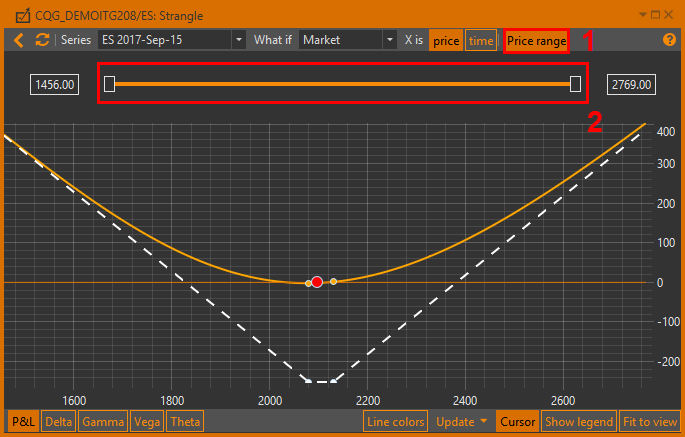 When you build a chart for a strategy containing options with different dates of expiration, the prices of the further futures are calculated as the price of the nearest futures, adjusted for the interest rate, which is set in the settings. The Interest rate parameter is a risk-free interest rate. The value of this parameter affects the pricing models' computations. You can change the Interest rate in the Settings → Pricer tab section. The X-axis shows the price of the underlying asset in a specified range. 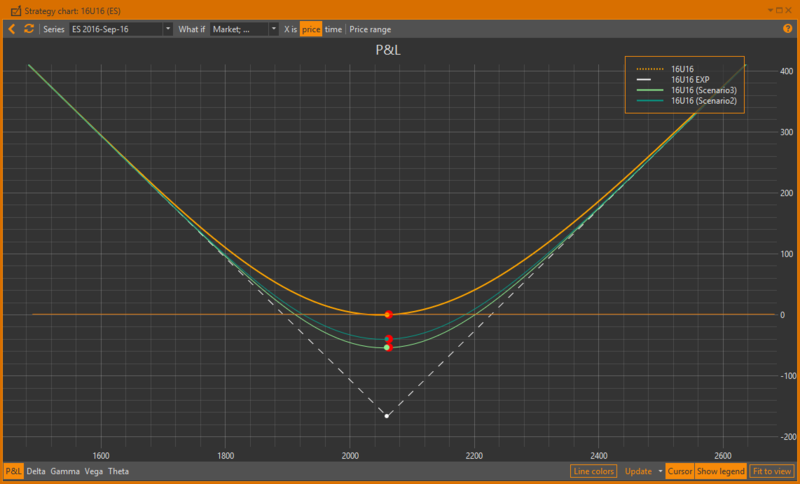 For details on how to specify the prices range see the X-axis settingssection. – chart on the expiration date. The drop-down list (Expiration date) with expiration dates of options is available if there are options from the different series.You can select on which date to build the chart. 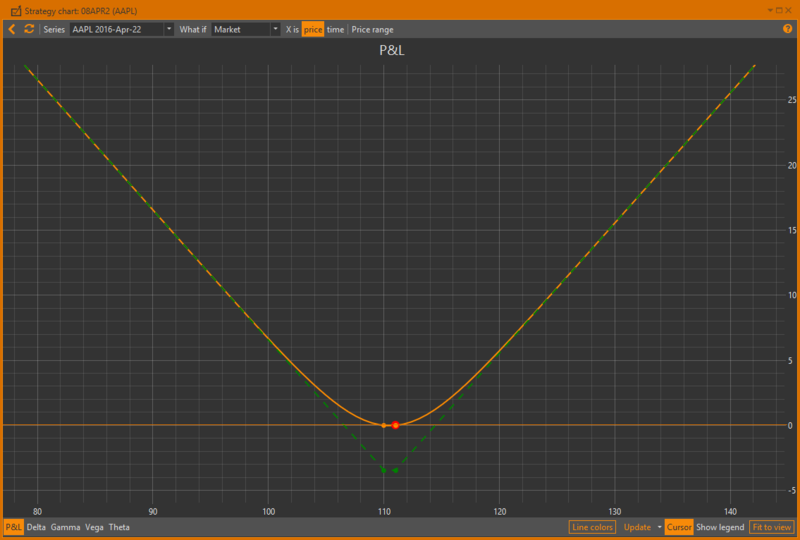 You may set different chart line parameters. For details on how to set line color, thickness or style (solid, dashed, dotted, etc. ), see the Lines setup section. Strikes of open positions in the selected strategies are marked by points on the chart. The current price of the underlying asset is shown with the red point. 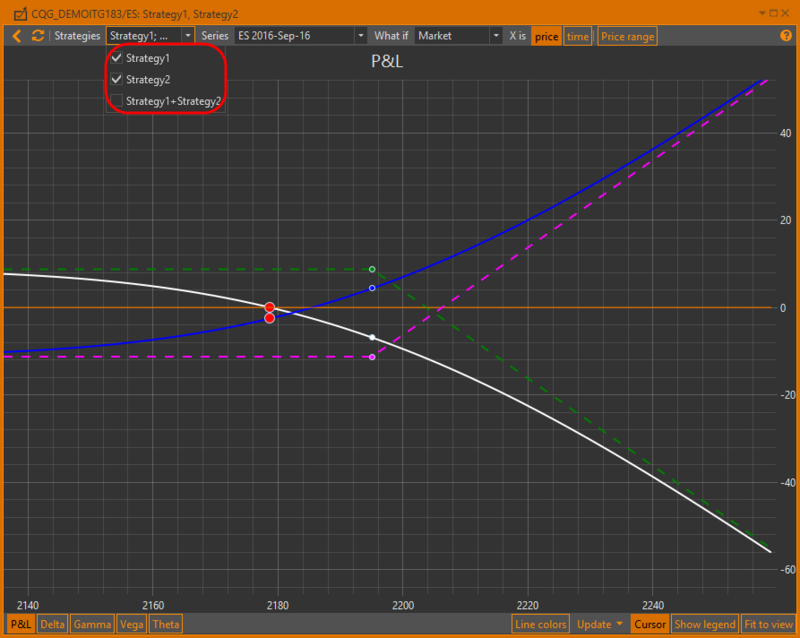 If the strategy contains option positions on different futures, each future will be shown with the red point marker. 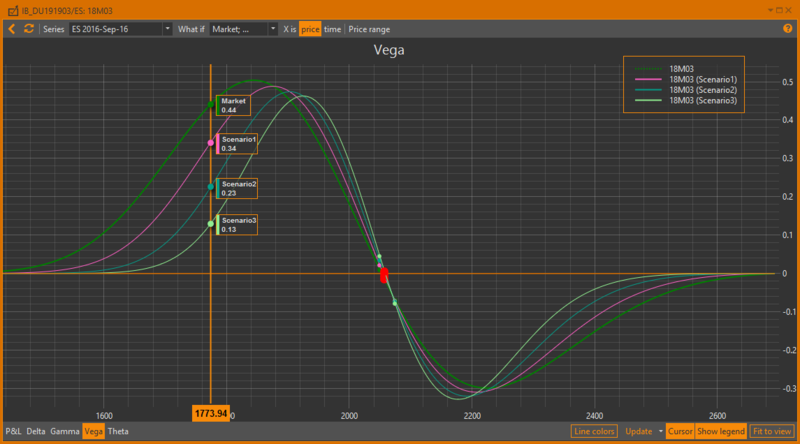 If the strategy contains positions of different series, the user can view charts for each of them. First, select the series in the dropdown list  and update the chart . Click the Price range button . Click-and-hold to set the lowest and the highest prices . When you change (manually or by using the slider control) the price range the charts are updated automatically. 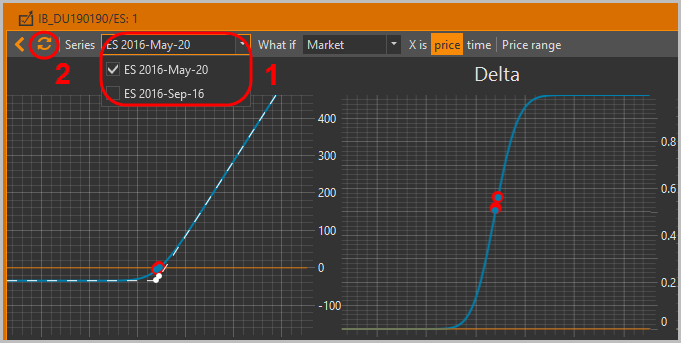 To view changes in the strategy parameters depending on expiration date, click Time in the X is field. The following figure shows an example of a chart. Days to expiration date are shown by the x-axis. 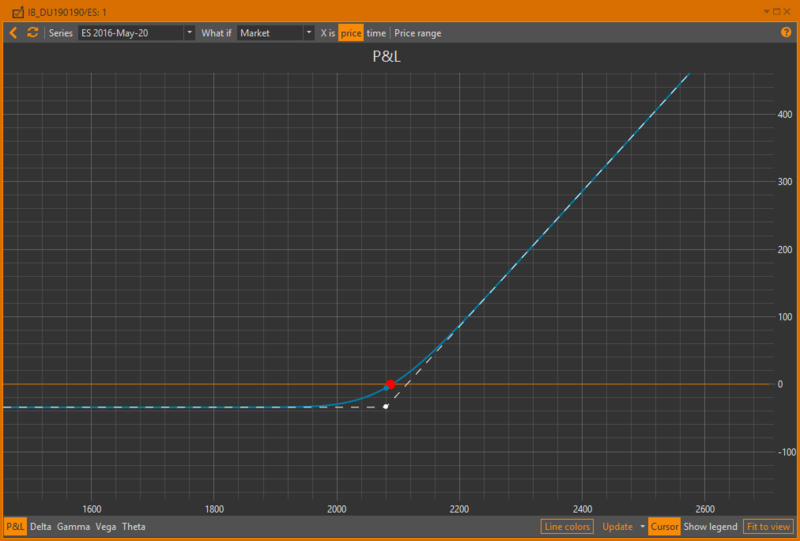 Point 0 on the X-axis is the current date. Therefore, at the current price of the underlying asset the profit rate will fall closer to the expiration date. Click the pop-up button labeled Click to apply changes that opens while changing a price range, selecting the series or scenario. Note that if you have added or removed positions in selected strategies or edited their properties or edited what-if scenarios (even if they are currently selected), then refreshing charts will reflect those changes. So you don't need to reopen the strategy charts window every time you make any changes. 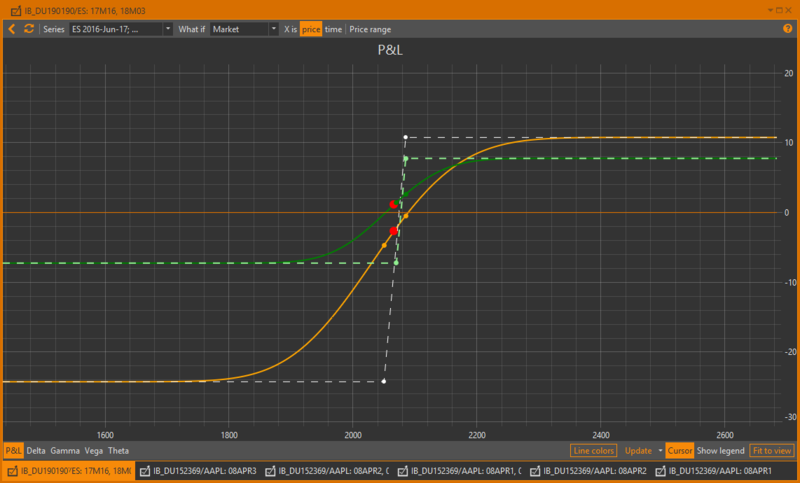 Placing the cursor over the chart will generate a tooltip containing the value of the data point on the X-axis and Y-axis. To display the guide lines, click on the Cursor button. To hide or show the legend, use the Show legend button on the bottom of the Strategy chart form. Click the Line colors button on the bottom toolbar and the following dialog will pop-up. Select the desired strategy . 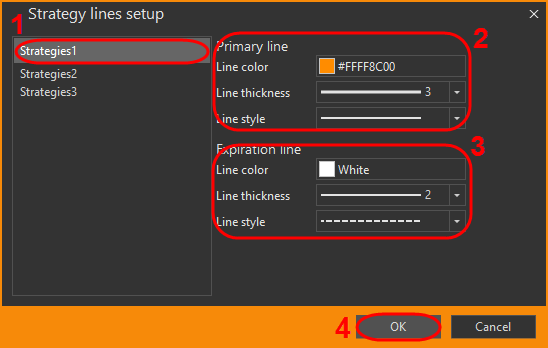 Set line parameters, such as line color, thickness or style (solid, dashed, dotted, etc.) for the current date line  and for the futures expiration date . Click the OK button to apply the settings. 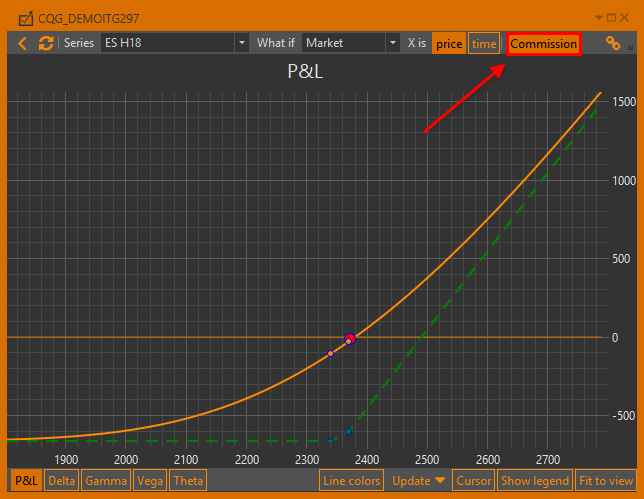 To display the profit/loss chart taking the commission for the fills into account click on the Commission button. The chart is shifted down to the size of the commission. Information about how to set the commission size for the fill is given here. You can bind the strategy charts form and the active strategy. Expand the What-if scenarios selector in the top toolbar. Select the what-if scenarios you want to display. Click on the top toolbar or click the pop-up button labeled Click to apply changes. Note that there is market scenario, which represents the current market situation. 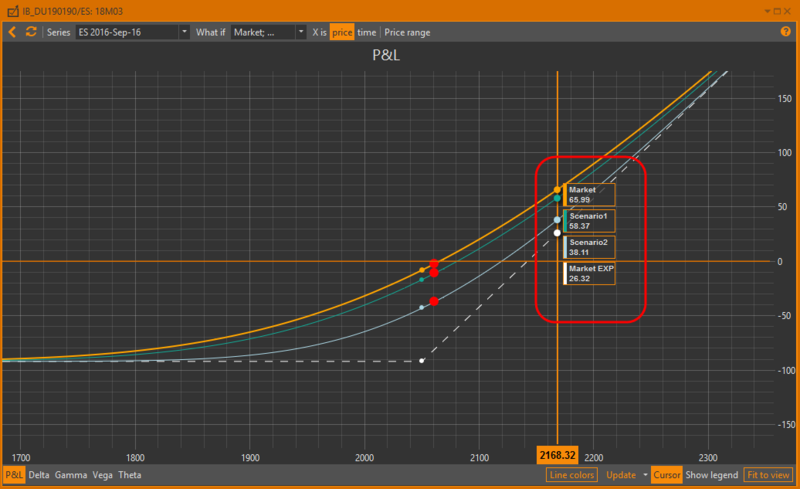 If no user scenarios are selected, then market scenario will be selected automatically. 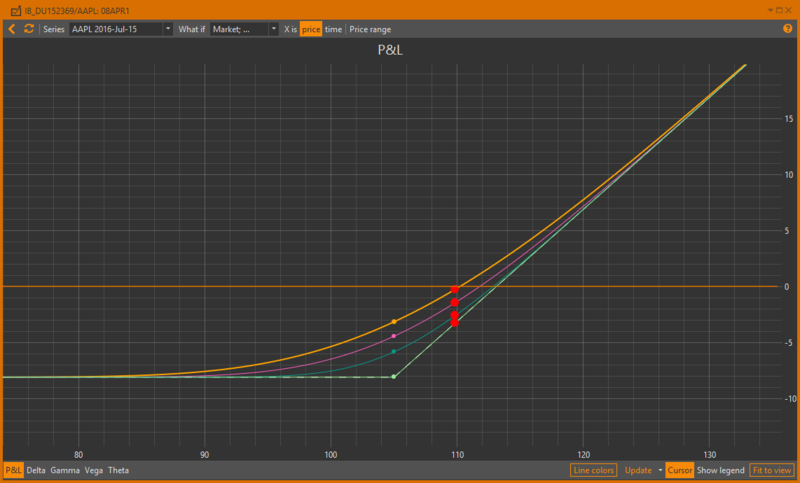 The PnL chart below shows an example of applying scenarios using a different time until expiration. Hovering the mouse over any point on the chart creates a pop-up info window with the values of profit/loss for each scenario. Examples of the strategy and scenarios charts are below. To return to default size double-click the left mouse button on the chart (or click the Fit to view button in the bottom toolbar). 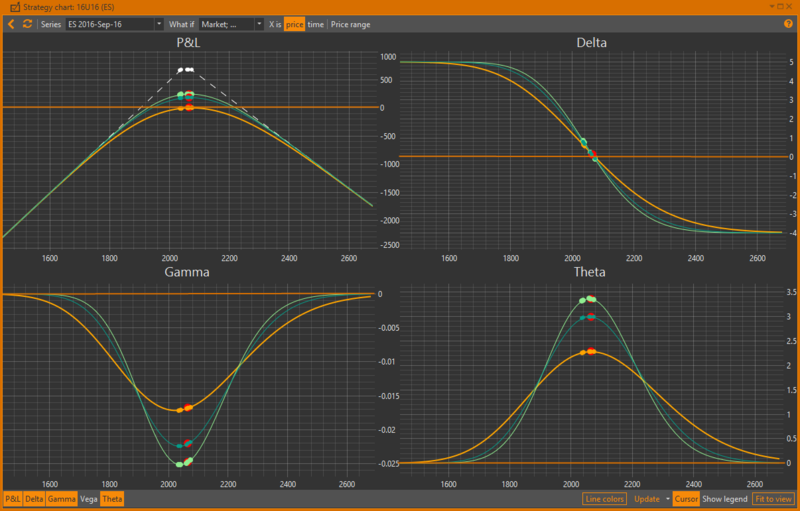 To maintain horizontal and vertical zoom ratio, hold the right mouse button while dragging the X-axis or Y-axis. 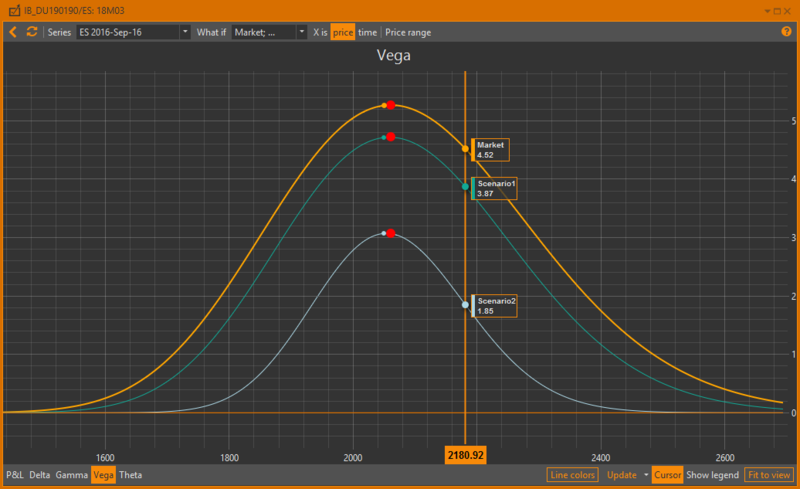 To scroll the chart horizontally or vertically, hold the left mouse button while dragging the X-axis or Y-axis. Basic chart settings, such as the charts visibility and X-axis range, are automatically saved, so you do not need to set them each time you open a Strategy chart. 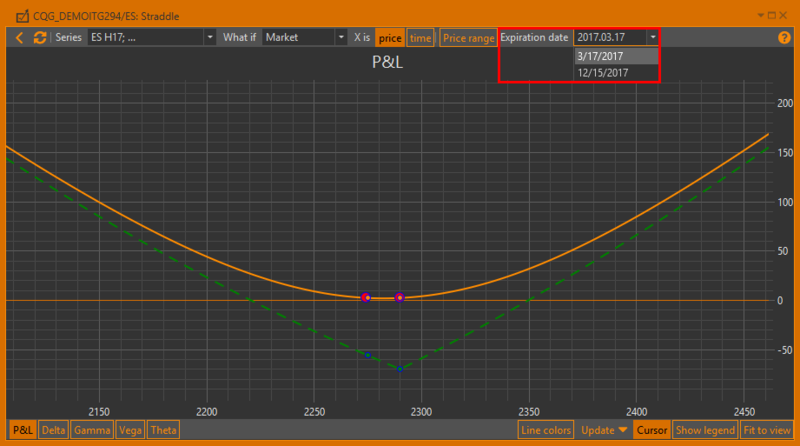 Any other chart settings (selected what-if scenarios, chart line parameters, auto-refresh mode, charts' zooming and positioning) are reset when a Strategy chart window is opened.